If you live in Florida you know that a smoothie is great on almost any day...this weekend was no exception. It was absolutely gorgeous this weekend, and a lot of our day was spent outside. (Especially since I got a fitbit and I somehow want to meet my 10,000 step goal). Sunday afternoon I got really hungry like an hour before dinner. While I was menu planning, I came across these delicious looking smoothies. On my husband's way home I decided to have him stop by the Farmer's Market and pick up some fresh strawberries and bananas. I sent him outside with Bennett and told him I would make him a smoothie, this is what I came up with, with what I had. 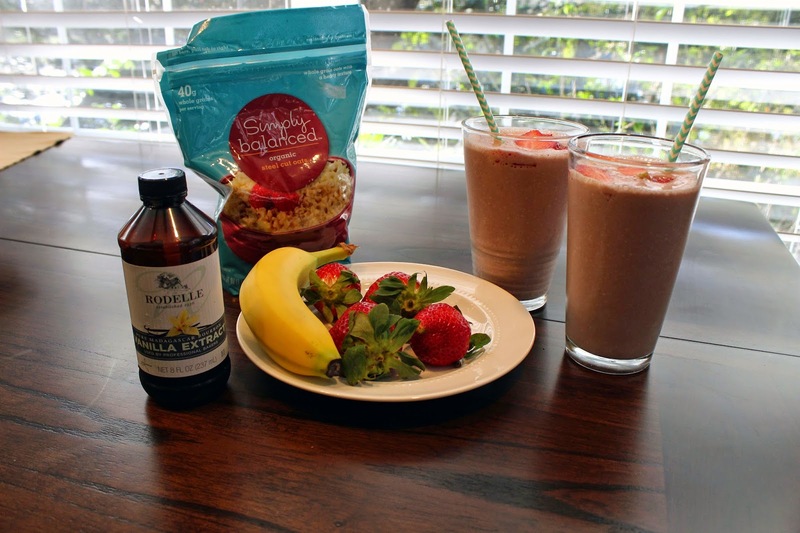 Mix banana, strawberries, chocolate milk, vanilla, and steel cut oats together in blender. Mix in ice.